Are you looking to take your business to newer heights of success? You need to work on the marketing strategies of your business. Nowadays, nobody likes the good old ways of business promotions. People are looking for more engagement and something that will appeal to them. That is why the vehicle graphics have become so popular. Just pick the right color scheme, come up with a catchy caption along with a heartfelt message for your clients, and add your brand name and logo to it with your contact details. That is all you need to become popular in the market. We, at Titan Wraps, can be the right choice for you. We are one of the leading sources of Vehicle Graphics for you. We are known for our expert and creative installers who can help you with such signage work. Equipped with technology and a good aesthetic taste, we can truly add a new twist to your marketing agendas. So, if you belong to areas like Carrollton TX, Dallas TX, DFW, Frisco TX, Lewisville TX, and Plano, then you must resort to us. 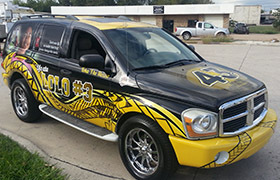 Here, we have enlisted a few vital tips on finding the right vehicle graphics company near you. Take a look. Instead of depending on people, you can do a little research on your own if you want to find the right company which can execute the vehicle graphics idea for you. If you cannot find a way out with research, you can take help from people. Just ask your acquaintances, friends, and people in your circle if they have ever used vehicle graphics for business promotions and where could one find them. Lastly, you need to compare the rates of different companies providing vehicle graphic services so that you can find the one which offers you the lowest rates by comparing them. So, if you think we can be the right choice for you, quickly get in touch with us.